With virtually all of Houston under construction, finding the hotel was slightly difficult. But upon arrival, the front desk staff was very helpful and friendly, explaining all the amenities of the hotel such as complimentary exercise room access and free video rental, as well as the location of several local restaurants. The complimentary soda from the kitchen area was a nice touch. The hotel was very clean from the front desk to the elevator and into the room. For all the features that came with the room, I feel I truly got a bargain at this hotel. I would readily stay at the Candlewood Suites again. Great room and amenities for price. The room I stayed in after my surgery was very accommodating. It appeared to have been freshly painted with everything in working order. There was a very comfortable recliner where I spent most of my time, since surgery required elevation. Unlimited free video borrowing also helped to keep my mind occupied. Only complaint I have is regarding the bathroom washcloths and towels. They were very rough and uncomfortable to dry with or wash face. The main thing I am upset is the fact I chose two queen beds so my husband could sleep in opposite bed since I would have been just out of surgery. The hotel/suites informed us they don't even offer that option. Their suites only have one bed. Full kitchen, free internet, unlimited free video borrowing, ample parking, and free gym. No continental or breakfast bar. A very nice place to stay. Located just halfway between friends and family. Really liked being greeted each morning by the colorful parrott/parakeete outside our window. The internet was a little slow and choppy at times, will bring air card next time we visit. Clean, comfy, liked the pantry option. Elevator was slow and kind of scary. The pet-friendly Candlewood Suites Houston - Town and Country is located off Interstate 10 and the Sam Houston Tollway and comprises 122 suites designed for the extended-stay business and pleasure traveler. Items included with the room rate at this three-story hotel are high-speed Internet access, a guest laundry, in-room coffee and local telephone calls. 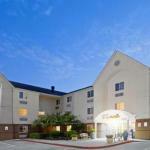 The property is located in the heart of the Houston Energy Corridor. Area landmarks and attractions include Memorial City Mall, Minute Maid Park, Reliant Stadium, the Houston Zoo, the Aquarium Downtown, the NASA Space Center, the Schlitterbahn Water Park, the Children's Museum of Houston, the Houston Museum of Natural Science and shopping at the Galleria Mall which is five mile from the hotel. The suites have a kitchenette with a coffeemaker, refrigerator with ice maker, microwave oven, stove, dishwasher and toaster. Other amenities include a work desk with high-speed wireless Internet access, two dual-line telephones with voicemail and speakerphone, television with cable news and movie channels, DVD and CD players, alarm clock-radio, iron and ironing board and a hairdryer. Non-smoking suites and handicap accessible suites are available. This hotel had a fitness center and a picnic area with barbecue grills. The 24-hour front desk has safe deposit boxes and information on area landmarks and attractions. Other amenities include a guest laundry, same-day dry cleaning service, a car rental desk, a business center with copy and fax machines available for guest use, a newsstand, daily housekeeping and ice and vending machines. The Candlewood Cupboard has a variety of breakfast items, snacks and frozen entrees all priced under $5. Restaurants nearby include Pappasitos Cantina, a Taste of Texas, a Pappadeaux Seafood Restaurant, Lubys and the Brio Tuscan Grille. If you're looking for a chocolate on your pillow every night this is not the place to stay. But if you're looking for a quiet, modern, clean, nicely kept hotel, this is the place to be. That is the view of one guest who stayed here and it sums up the opinion of other clients. The staff here is very friendly and helpful and gives great directions to the area attractions. The beds are very comfortable and the rates are reasonable. Parking: Yes, there is parking. Contact hotel for details. Pets: Yes, pets are allowed. Fees and restrictions apply.